•"A terrific resource for tennis players and their families." •"Tennis Resorts Online is a one-stop shop of a website that provides unbiased reviews of hundreds of tennis camps, resorts and hotel complexes throughout the world." 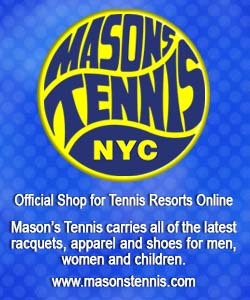 •"This online resource for tennis resorts is the most reliable one out there." •"I know of nowhere else that you can find this amount and quality of information about tennis vacations. The website is up to date, accurate and answers all my questions. Roger Cox is a real pro and makes my choices easy with his many years of experience in tennis/travel." •"A helpful resource ... which has a wealth of information on these 'swinging' vacation spots." •"Cox's experience as a travel writer ... has made him an unparalleled expert in the field of tennis travel." •"An authority on tennis resorts, Cox is to tennis travel what Webster is to dictionaries"
Tennis Resorts Online's founder and editor-in-chief ROGER COX has spent more than 30 years writing about tennis travel. That long stint included a 17-year stretch for Tennis magazine, during which he visited more than 300 tennis resorts on five continents and personally participated in over 50 tennis camps—several of them more than once. His informed perspective on the entire tennis resort and tennis camp landscape underpins this website. No resort paid to be surveyed here. These are not ads but informed descriptions based on Cox's broad, firsthand knowledge and on the wisdom of the Tennis Resorts Online visitors, who are invited to comment about their own vacation experiences. The point of it all is to help you make better choices about where to take your next tennis vacation. Apart from his stories for Tennis, Cox has written hundreds of additional articles—mostly about travel and occasionally illustrated with his own photos—which have variously appeared in Budget Travel, Continental Magazine, New York Magazine, Travel & Leisure, Esquire, Money, Working Woman, GQ, Tennis magazine, Tennis Life Magazine, USTA Magazine, Diversion, Men's Fitness, Men's Journal, The Robb Report, New Choices, New England Tennis, Bridal Guide, and For the Bride, among numerous others. He has also written two books—The World's Best Tennis Vacations (Stephen Greene Press/Viking Penguin, 1990) and The Best Places to Stay in the Rockies (Houghton Mifflin, 1992 and 1994)—and the Melbourne (Australia) chapter to the Wall Street Journal Business Guide to Cities of the Pacific Rim (Fodor's Travel Guides, 1991). He is a member of the American Society of Journalists and Authors and a past president of the New York Travel Writers Association. He is probably on the road somewhere right now.